I know, food is a communal joy, a pleasure to be shared around the table with family and friends both new and old. But to each of you reading this, let me say that I wish for you just once to experience the moment of utter, profoundly selfish delight I felt this week while eating a slice of bread. To backtrack: this was no ordinary bread. How I stumbled upon it was rather ordinary—I photocopied a few pages from a friend’s book, My Bread: The Revolutionary No-Work, No-Knead Method by Jim Lahey. True, the titular claim sounded a bit far-fetched. But bread-making had been a distant goal of mine for some time so I decided to give it a try. The Lahey method stressed full dependence on time, and I was in no rush. I mixed the dough. I waited the requisite 18 hours, then a bit more for good measure. I pulled the dough out of its bowl and into a dishcloth. I waited another two hours. I heated the oven, with an old Le Creuset pot in it, and when it reached 475 degrees I awkwardly dumped in the dough. Thirty minutes passed, and then the room began to smell like bread. It was a wonderful—no glorious—aroma, the kind that draws you to the oven to peer inside. It was time to remove the lid and let the crust brown, and it was all I could do to fidget around the room for ten agonizing minutes, rearranging piles of mail and straightening the tablecloth. When I finally pulled it out I felt the sort of pride I’d previously associated only with my fifth grade reproduction of Botticelli’s Venus and Mars, or maybe my acceptance into college. In the recipe Lahey had specifically warned against cutting into the loaf right away, recommending an hour’s wait. An hour? An iron will (not in my arsenal) would be required. I stood alone in the kitchen with my bread, the crust almost too hot to touch and the inside a soft, fragrant network of air pockets. The first bite was joy, pure and simple, the crispness of the exterior giving way to a moist and tangy center. I ate slice after slice, dipping them in olive oil sprinkled with salt. It was the kind of reverie you awake from to find, to your confusion, that the sun is still shining and half the loaf has vanished. An hour or so later I lay immobile, the sheer volume of the bread I’d consumed weighing painfully with every breath. But Oh—it was delicious, worth every bite. 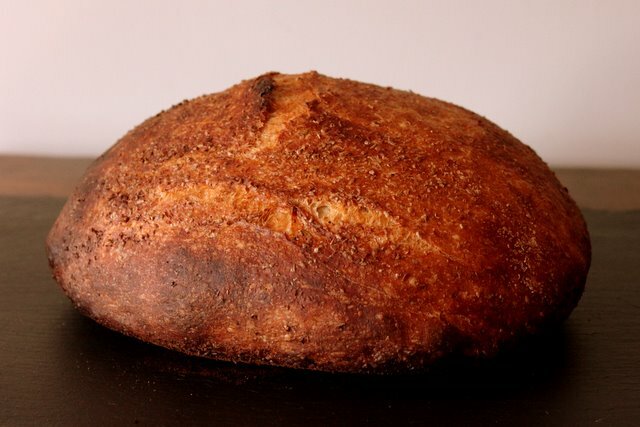 The chemistry of this bread is fascinating–Mark Bittman describes it eloquently in a way even my meager science mind can grasp. The traditional recipe calls for 3 cups of bread flour, but I had great success substituting in one cup of whole wheat. I also found I consistently needed more than 1 1/3 cups of chilled water to create a moist enough dough. Mix together dry ingredients in a large bowl, then add chilled water and stir with a wooden spoon until you have a cohesive–but very wet–dough. Set aside in a warm environment for 18-24 hours. Lay out a clean dish towel (not terry, as it can shed) and sprinkle with wheat bran. 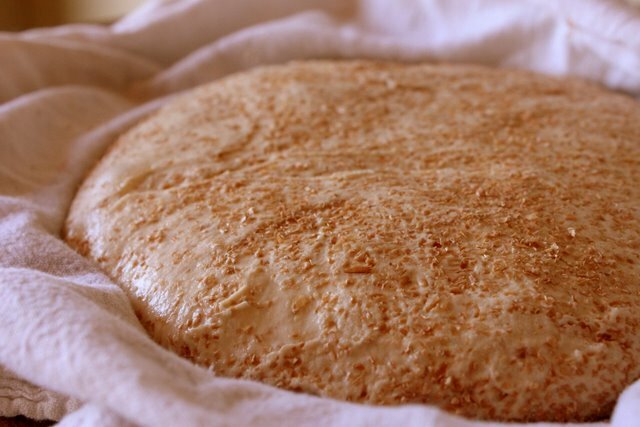 Gather your dough (it should be doubled in size and dotted with bubbles) with well-floured hands and transfer it to the center of the towel, pulling in the edges of the dough towards the center to create a nicely-shaped round. Sprinkle the top of the dough with wheat bran and loosely cover with the edges of the towel. Set aside for 2 hours. After 1 1/2 hours, heat your oven to 475 degrees with a large, lidded enamel or cast iron pot inside. When the oven is heated, remove the pot (careful–it’s very hot!) and coat it lightly with olive oil and flour, then transfer your dough from the towel to the pot. Cover and bake for 20-30 minutes, checking if the aroma begins to indicate burning. Remove the lid and bake for another 10 minutes, or until the crust is a dark brown. Remove from the oven and lift the bread from the pot with a wooden spatula, then set aside to cool for as long as you can resist. Ok. That bread is amazing. I sort of rushed the process willing to wait only 14 hours for the first rise. The dough was so wet I couldn’t imagine that it would become bread. Since you ate it hot from the oven, I certainly had to do the same. It’s dripping with butter as I post this thank you to you. Love your blog. Love your bread. Say hi to your family for me. Yes! 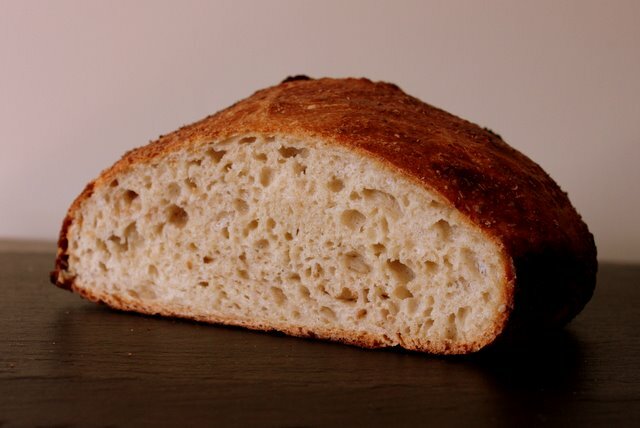 The many variations on “No Knead” breads can be wonderful. As an experienced ‘bench shaper,’ I still fear transferring that beautifully proofed dough to the hot pan. Naturally, it falls. For my generation, ‘falling’ and loss of inflation are marks of instant failure or poor technique. I’m past that trauma and I understand that the fall is expect – that I’ll still get a wonderful loaf. I’ve tried a semi-formed loaf and using parchment for the transfer, but (Duh??) one simply does not form a dough that is that wet (high hydration). As contrary as it always seems, the no-knead breads make a superior product and with relative ease. More (early) Boomers like me ought to give up the traditional rules, follow the damn directions and enjoy yet another, satisfying bread. -C.
Also check the Cooks Illustrated variation on this bread. Even if you do nothing else, try their advice re using parchment paper instead of a floured towel, to simplify transfer to the dutch oven.